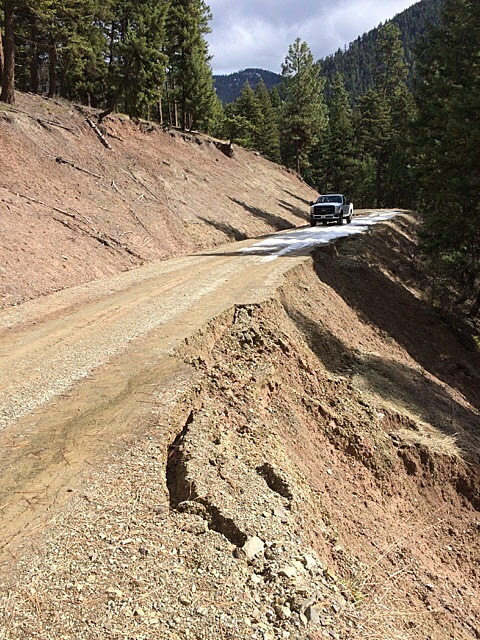 Recent snowmelt is softening some roads on the Lolo National Forest, and forest managers are advising the public to use caution and avoid saturated road beds to avoid damaging the roads and soils. And, of course, avoiding soft road beds also reduces the likelihood that you’ll get stuck on a forest road. Most damage to unpaved roads occurs in the fall and spring when rains and snow-melt saturate soils, leaving surfaces soft. Vehicles create wheel tracks and ruts which can hold and channel water and lead to erosion and sometimes road failure. According to Chris Partyka, Lolo National Forest environmental coordinator, the forest can experience damage to road beds in spring, especially in areas with poor soils (high clay content or granitic soil) where people are trying to get out early to explore or gather firewood when road conditions are at their worst. The Lolo typically issues a closure order each spring that identifies roads that may be subject to short-term closure if an on-site inspection finds it necessary. The order allows for the placement of temporary road barriers that can be moved as conditions change. The public is asked to respect the signs or barricades that will be used to keep vehicles off roads until they dry out or firm up. In addition to avoiding soft and muddy roads, forest visitors should maintain caution when venturing out upon snow and ice covered roads that appear firm. Conditions can change quickly as daytime temperatures and solar radiation heats up what appears to be a firm surface in the morning. By midday, packed snow and ice that was driven on earlier can become soft, causing a vehicle to drop through and get stuck. Chains on all four tires may not be sufficient to pull a vehicle out of these conditions. Status: Closed from milepost 1.27 to the end of the road. A barricade has been placed at milepost 1.27. A segment of the road has slumped due to saturated soils.. Status:Closed from milepost 9.2 to 10.8. Water flowing over road due to blocked culverts. Status: Closed starting at mile marker 0.22 Shoulder of road has partially failed due to saturated soils. Forest visitors are asked to report road damage they find or inadvertently cause while driving this spring. As conditions change and additional roads are closed, or opened, please contact the respective Ranger District office for current road status.